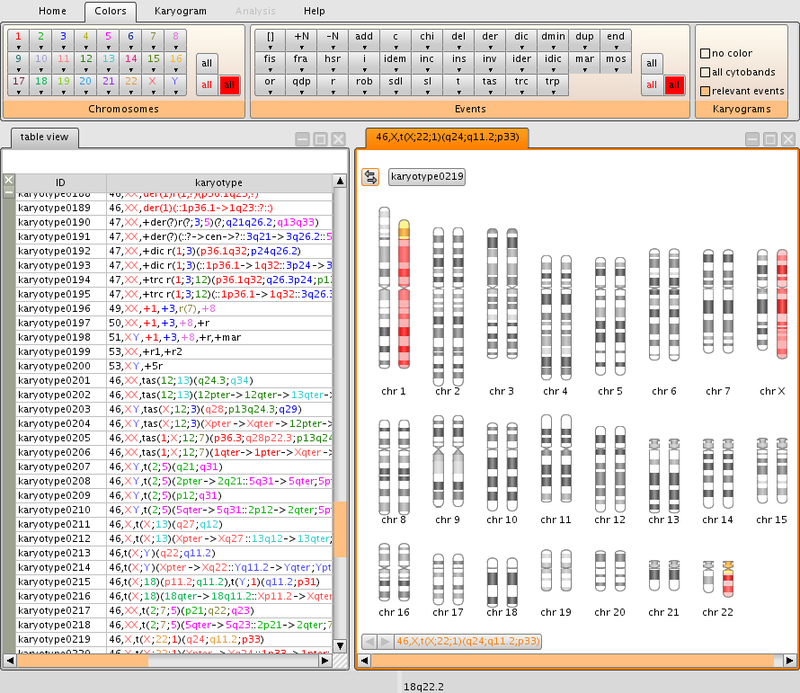 Karyolens is a fully integrated package for the visualisation and analysis of karyotypes with a rigorous, extensive parsing of the ISCN syntax. Karyotypes can be imported from databases and spreadsheets, or added in real time, together with annotations and clinical information. The fully integrated karyogram viewer gives an instant color-enhanced graphical representation of the textual information. The flexible interface facilitates the extraction of meaningful information from large amount of data. Users can navigate databases of thousands of karyotypes, sort and group cases by event or clinical information, and access relevant information from external sites (e.g. the Mitelman database). karyolens's fast ISCN parser helps quickly check syntax compliance while the slide is under the microscope, suggesting correction when an error is detected. 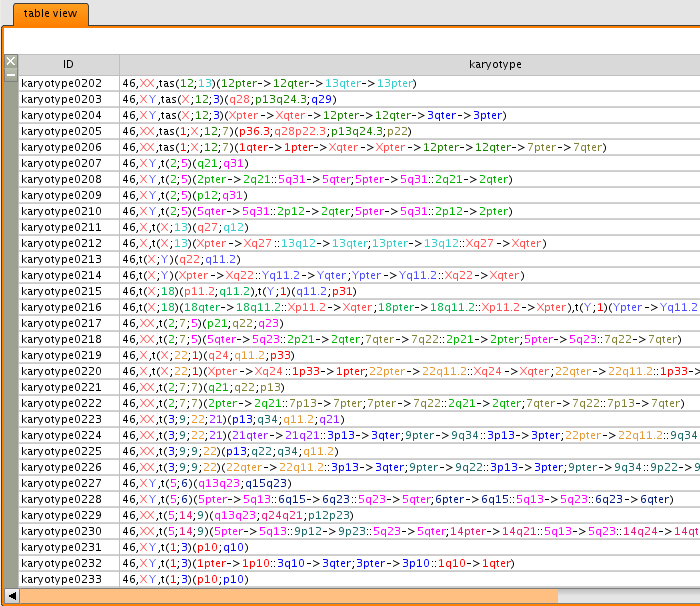 Karyotypes can be coloured by specific chromosomes or events with a large palette of syntax highlighting options to help discover patterns in databases and contrast groups of patients or events of interest. With a number of colouring options, fine control over the number of bands per haploid set and user-defined layouts, our karyogram viewer helps quickly identify abnormalities of note, prepare figures for publication and communicate results to non-experts. The Northern Institute for Cancer Research at Newcastle University (UK). 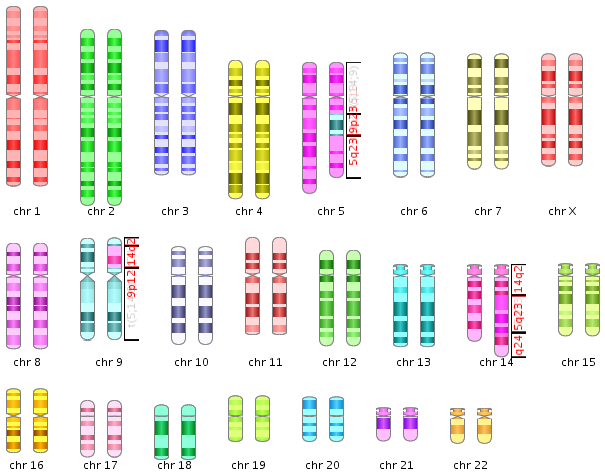 The ISCN nomenclature is used to describe chromosome translocations and other abnormalities of the human genome. It is specified in a 138 page book but is intended for human use rather than machine parsing and is sometimes ambiguous. We wrote one of the few parsers capable of handling this syntax, enabling the automatic generation of graphics and smart search among thousands of karyotypes.